I am often asked about my purpose in life, how I found it, and the ways in which it has informed my life. Many studies have found that purpose is often the result of an accidental event, or of pure luck and circumstance; mine is no different. The event that led to the discovery and crafting of my personal purpose was the defining experience of my life, and I see it as what psychologists Roy Baumeister and Kathleen Vohs call "the continual organizing principle" of a life: that thing that stays constant even amidst change and uncertainty and suffering. When I was fifteen years old, I spent a month volunteering at an ashram in India that is a home for persons with leprosy and various disabilities. I had gone to India on a gut feeling that was honestly little more than a whim, borne of a dispirited frustration with my suburban bubble. I landed in Chennai in the midst of a terrible period of flooding, with water seeping in to the airport all the way up to my knees. The flooding had bungled our original service project of helping to build a school that was now three feet underwater, and in a last minute decision, our group was put on a 24 hour train ride with absolutely no idea of where we were headed. When we arrived at our stop many long hours later, it happened to be the middle of the night; in the frantic rush to get off of the train during the sixty-second stop, I lost my shoes. Little did I know, while walking through a train station in rural India barefoot full of fear (and not a little regret that I wasn’t home enjoying that suburban bubble), that I would leave a few weeks later with a certainty of my purpose in life – nor that this accident of nature, the flooding in Chennai, would inform nearly every decision I’ve made in the ten-plus years since. We soon learned where exactly we were: a place smack in the center of India, an ashram called Anandwan. Translated, this means Forest of Joy, so named because it began as an outdoor hospital under a tree. The founder, one of Gandhi’s followers, had an unshakable belief that work is a pathway to self-empowerment. 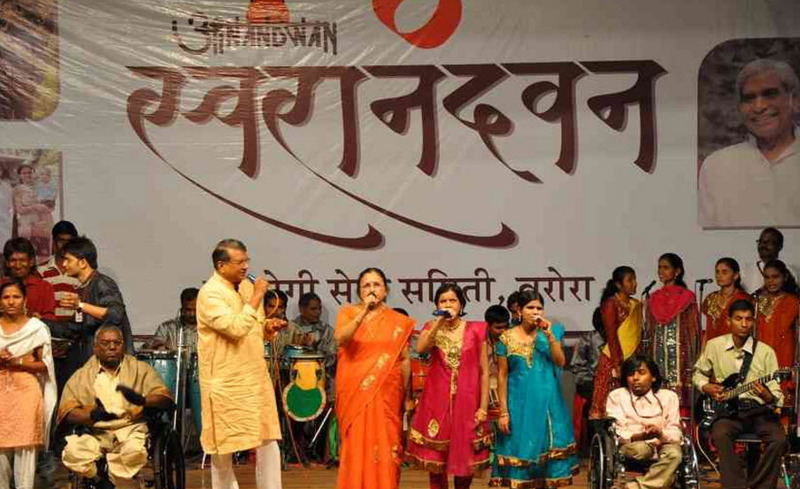 Anandwan welcomes people with leprosy and disabilities, blind and deaf children, and people from marginalized parts of society. Every individual is warmly welcomed and expected to learn a specific way that they can contribute to the overall flourishing of that community. Teachers, doctors, barbers, administrators, artisans, craftsmen or students: every resident plays an important role in the fabric of the successful functioning of the society. This ecosystem has become so powerful that the only three items that are not produced within the community are salt, sugar and oil. The success of this truly cooperative vision can be seen in their leprosy hospital, which has performed over 16,000 free operations: it is not only considered to be one of the world’s best hospitals for this disease, but it is managed entirely by those who have been cured of the disease. Through their work, individuals are empowered to engage in a positive upward spiral: they develop skills that engage them, use those skills to make valuable contributions, rediscover through those contributions their inherent self-worth as human beings, and use this process to create meaning and cultivate greater well-being in their lives. From the darkest moments of life-threatening illness or unexpected disability or rejection from one’s family, these individuals walk a path towards a new existence that accommodates their realities but encourages them to transcend them. One of the most magical manifestations of this, in my opinion, is the creation of an orchestra and dance troupe made up of community members; they have performed more than 750 times around India. As a sheltered fifteen-year-old, I arrived there with no understanding of what it meant to be absolutely devastated by life’s circumstances, and the unbelievable courage that it takes to create a new way of being that simultaneously honors that devastation and creates a pathway to transcend it. I watched people who rediscovered their inviolable worth as human beings through their work; I watched as this then spilled over into other areas of their lives, begetting friendship, positive emotions, art, and even love. A particularly memorable moment was the day we attended the wedding of two former leprosy patients. As I watched, I grew quieter, in an attempt to accommodate the new stirrings within me, currents of emotion and thoughts that slowly coalesced into an awareness of something I had never expected: that the delivery and execution of this truth could be my purpose in my life, that perhaps I could help to change our world so that work could become a meaningful vehicle for personal transformation and for well-being. I grew up in a healthy and successful family, in a big house, in an idyllic town. I had every physical and emotional blessing that anyone could conceivably ask for. Yet, for the longest time, I was not happy; I constantly lived in fear that all of these blessings would one day go away if I ever did anything wrong. My childhood and teenage solution was to seek perfection in myself so that if everything good did go away, I would not be to blame. By the time I applied to go on this service project, I recognized that I had to do something to gain some perspective. As I embarked upon the journey, I sensed that I was on a pilgrimage of some kind. While I was there, I experienced what every pilgrim hopes for – transcendent moments, loss of my limited identity and discovery of a purpose. Viktor Frankl believed that purpose in life was found by looking outward, at the world or at other people. This month provided me with an opportunity to deeply engage with the world in a new way. It also helped me to develop a very rudimentary awareness of the reality of human suffering and a pathway for its alleviation. The power of providing men and women with empowering work, which helps them to cultivate belief in their worthiness as human beings, has never left me. Meaning has been described by the psychologist Michael Steger as an integrating factor that pulls together one’s ideas about who you are, what the world looks like and how you engage in it. In the ten years since this experience, I have devoted myself to learning as much as I can so that I might help to alleviate human suffering at scale around the world. I have also focused deeply on learning how to understand myself (suffering and all), knowing that it is critically important that I also mind my own psychological health. It has not been a straight road. I have often wandered off into the valley of ‘Worldly Success’, losing sight of my true purpose. However, reflection on this experience always brings me back to what truly matters. I aim to devote my life to helping others to find love, joy and peace within themselves, for I have seen that even in the presence of immense sadness and pain, it is possible.